The Nigerian Army has appealed to religious, traditional and community leaders, as well as all well-meaning Nigerians especially in the North East of the country, to help dissuade people from donating their daughters or wards, to Boko Haram terrorists for indoctrination and suicide bombing missions. The shocking revelation was contained in official statement of the federal government awareness platform, PRNigeria Saturday and signed by the Director of Army Information, Brig. Gen. Sani Usman. This appeal became expedient in view of recent revelations by some intercepted female suicide bombers during interrogations. 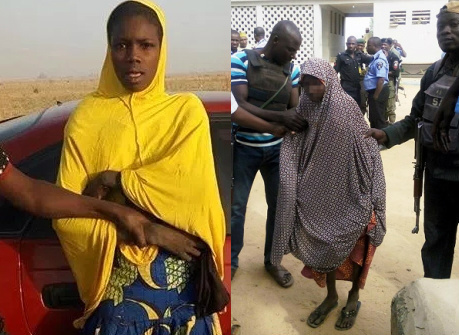 It was discovered that most of these hapless minors were “donated” to the terrorists sect by their heartless and misguided parents and guardians, as part of their contribution to the perpetuation of the Boko Haram terrorists’ dastardly acts against the Nigerian society and humanity. The acts of these parents and guardians are not only barbaric, but condemnable and unacceptable. Nigerians have a responsibility and obligation to collectively mould our children and wards and define a better future for them rather than condemning them to death by the criminal Boko Haram terrorists and their sympathizers through suicide bombings. Consequently, the public is kindly requested to be more vigilant, security conscious and report any suspicious persons or those whose daughters or female wards are missing or have not been seen recently. You can report by calling 193 on any network. The public is also please reminded that the Nigerian Army’s offer and reward of the sum of Five Hundred Thousand Naira (N500,000.00) to anybody that brought information about suicide bombing, is still available. EVIL PARENTS AND DEVILS ADVOCATES..THE NORTH HAS DRAGGED US BACKWARDS SINCE INDEPENDENCE.THEY HAVE RULED FOR DECADES MORE THAN ANY REGION IN THIS FRAUD CALLED NIGRIA.THEY ALLOCATED THEMSELVES MORE SEATS IN THE REPS IN ORDER TO BLOCK ANY INITIATIVE THAT WILL MAKE THEM SIT UP AND CONTRIBUTE THEIR QUOTA.THEY INSCRIBED SHARIA IN OUR CONSTITUTION,THEY OWN GREATER OIL WELL ALLOCATION,THEY INCITE THEIR PEOPLE AGAINST OTHERS.THEY CLAIM ITS A BORN TO RULE IDEOLOGY.WE HAVE A LONDON BASED PRESIDENT,DISAPPEARED FOR MORE THAN HUNDRED DAYS WITHOUT ANY PRESS CONFERENCE UPDATES FROM THE EXECUTIVE BRANCH OF GOVT.CONTINUE THE BOMBINGS AND DESTROY YOUR PLACE UNTIL PHAROAH WILL LET MY PEOPLE GO. Good, please you people should donate more. Mumu cow people why can’t you people do the donation of the bombers smartly so that you don’t get got by those zombie stupid nigeria soldiers. Idiot hausa fulani people. People that can’t think, even when they want to think, they use the brain of their cattles to think. Thunder fire all of you. Good, please you people should donate more. Mumu cow people why can’t you people do the donation of the bombers smartly so that you don’t get got by those zombie stupid nigeria soldiers. Idiot hausa fulani people. People that can’t think, even when they want to think, they use the brain of their cattles to think. You should donate that stockfish called buhari next time. THIS NEWS COULD be another lie from the mill of lies of the Nigeria Army. Was it not the other day that they claimed to have rescued some men kidnapped by BH, only for BH to do a video of the men in their captivity and release same to the public. The army had to eat their words after the leak. I NOW HAVE reason to believe that the army gives us stories from time to time just to appear very hard-working. Not that this story is not possible, anyway. Some parents are just useless and heartless.